posted by Venus @ 7:04 a.m. This is super beautiful, Venus. I have it in mind to start a sweater--when I get to Montreal. I was at a market yesterday--a gigantic market--and got stuck at a stall selling all sorts of yarn and sewing ingredients. Unfortunately, I have to go to a proper shop if I want yarn that isn't acrylic. That and it's EXPENSIVE! I think I'm going to start a yarn-of-the-month club with my mother--you know, she wants to clean out her crawl space, so she can send me yarn every month. I'm like that. 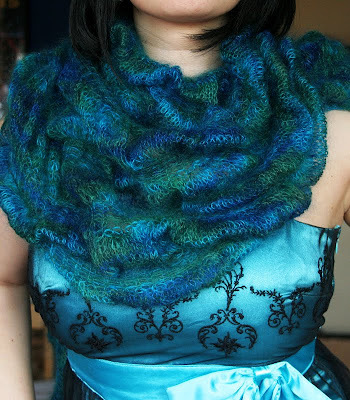 I started a shawl once, with a lace bell pattern. I think it's in a plastic bag somewhere at my mother's house. The last time I saw it was 2004, when I was into buying old sweaters and taking them apart to re-knit. Don't ask, for pity's sake, don't ask! Beautiful! 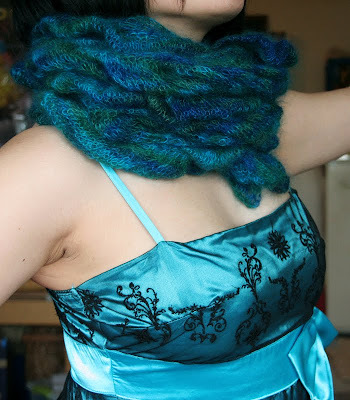 I love how versatile it is, and how soft it looks. Pretty dress too! I don't have nearly enough fancy frocks. Or enough events for wearing them. 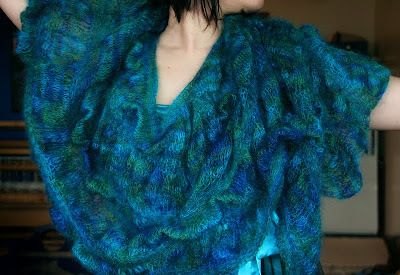 Alissa - I just sent my mom a sweater to take apart and reknit! lol. 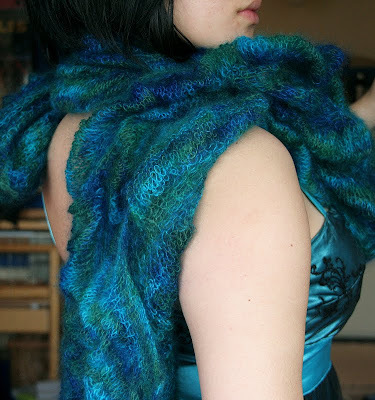 It's gorgeous wool, but was made (I suspect) in the 80s so the shape is less than flattering. I think she was going to pass it on to a knitter friend. From now on I will keep you and Venus in mind when discarding sweaters.